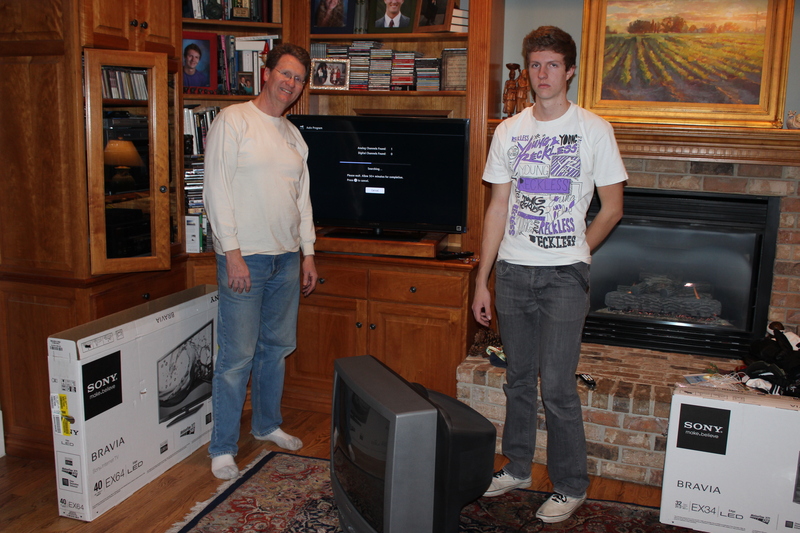 There’s been a man in our family room all day today, rebuilding the shelves where our old big box TV used to sit. A couple of months ago that old TV died. The kids Cheered–until John and I moved another big box TV from elsewhere in the house into its place. We were perfectly satisfied. The kids weren’t. They started needling us about replacing it with a new flat screen technological wonder. After several weeks of incessant begging, John caved and went and bought a new TV. It’s not even two inches thick. It does many things I don’t understand, like something called DVR which is a new way of recording programs. Actually the world around us has been using this technology for years–we just haven’t come to the party until now. We’ve been faithful and true to our VHS players and our stacks of tapes which we’ve used to record things on, over and over. The VHS player and the big fat TV have been moved to the Farm House next door. 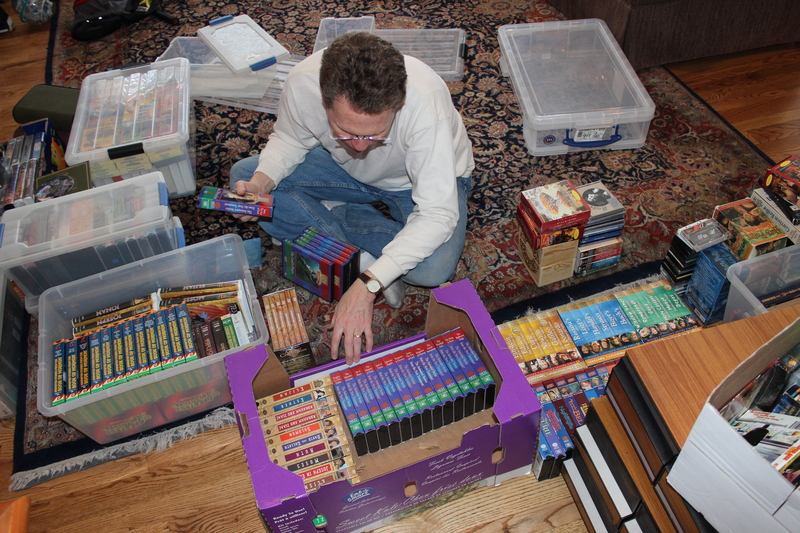 Once they were gone, we realized the day had come to sort all of our movies and thin out the VHS tapes that have filled our cupboards and drawers around the TV. It took a week or two to sort through all of them and decide what to do with them. We had a big box for the thrift store, another box with hundreds of VHS tapes (now owned on DVD) to give away, and several containers to keep and store just in case grandchildren some day might want to watch a movie, or Pooh Bear, or something we don’t have on DVD (John would have happily given them all to another home). I think we have about 20 Pooh tapes, each watched 100s of times. I could not bear to part with them, or beloved Disney films that helped shape and enlarge the world our children lived in. So several containers of tapes went to the Farm House attic next door to be near the exiled TV and VHS player. I’m not ready to part with them yet, although it’s not likely they will ever be watched again. But just in case, they’re there. So now we have what they call a “Smart TV.” It’s like a “Smart Phone.” I didn’t realize just how smart this TV was until last week when I was trying to find the channel for a BYU Basketball game. Aaron was at a youth activity on campus, I was home, listening to the game on the radio, frantically trying to find the channel. There were something like 700 channels to search. I phoned Aaron for help. “Yes, but I’m listening, not watching.” I thought he wanted to know how I knew the score. Then he asked, “Did the channel just change?” I looked at the TV, and there were our BYU boys playing! “Holy Cow! How did that happen? ?” I could hear him smiling as he said, “I fixed it for you, Mom.” He had programmed the house TV from his smart phone from several miles away. It was traumatic to pack away my beloved VHS tapes. It was more traumatic to have someone in the next town change the channel here. I don’t know if I’m ready for this next generation of TV viewing. It’s a little beyond my comprehension and skill level. I may need to go next door for a Pooh Bear fix every now and then, just for the comfort of it. 1 Response to Good bye VHS!